ARLINGTON, Texas – Jose Vitor Leme spent most of Sunday afternoon watching the Team USA Eagles begin their march up the scoreboard. Leme would glance up at the massive jumbotron inside AT&T Stadium and let his eyes glance over to the left side of the screen, where scores for the WinStar World Casino & Resort Global Cup USA, presented by Monster Energy, were tallying up. The 22-year-old remained calm, though, as the red, white and blue continued to frantically record ride after ride. Brennon Eldred picked up 81 points, Cody Teel went for 87 points, Sage Kimzey scooped up 87.75 points, 2016 World Champion Cooper Davis was a sensational 88 points and then Chase Outlaw brought a sonic boom to the U.S. contingency on the back of the chutes with 86 points on Skitso. At that point, Leme was just off to the side of the chutes beginning to stretch as Outlaw was whooping and hollering. Team USA were no longer Eagles. They had evolved into circling vultures. They were coming for their own kind of Brazilian barbeque. They felt it, and everyone knew it. The other teams had already been eliminated, and the Global Cup was truly down to a two-team race featuring the two best bull riding countries in the world. Coach Renato Nunes looked concerned after watching Claudio Montanha Jr. and Marco Eguchi buck off back-to-back. Nunes was hanging his head over the fence near the backpens and beginning to intently look at the list of bulls for the Bonus Round draft. The tide had turned in a big way. The Brazilian team that looked unstoppable Saturday night, going 7-for-9, was a paltry 3-for-6. Leme, though, was ready for his moment. A night earlier, he publicly said he did not come to AT&T Stadium to lose. Leme now had to back up his words with the Eagles on top of the scoreboard for the first time all event long. 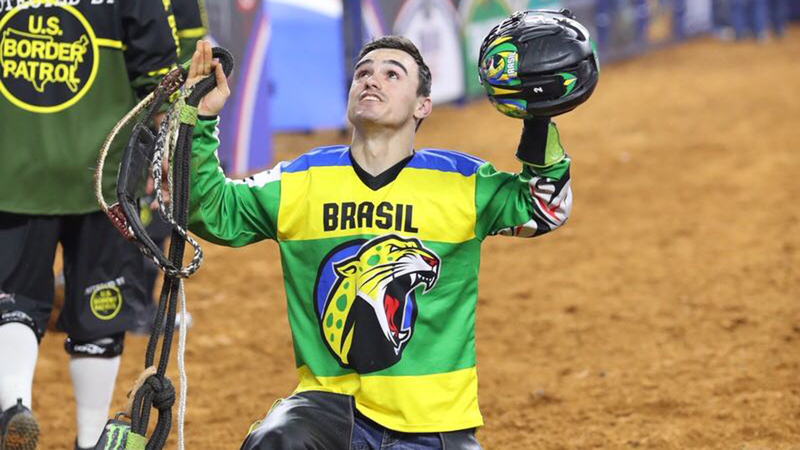 The 2017 World Finals event winner then roared Team Brazil back to life with an 89.25-point ride on Biker Bob to return them atop the leaderboard. “I was really kind of confident and relaxed because I always wanted to get on that bull, draw that bull, and to be able to ride him over here was a great deal, especially to be able to help my team with the score,” Leme said with the help of Paulo Crimber translating. Less than 24 hours earlier, he posted the only 90-point ride in Global Cup history with 90 points on Frequent Flyer. PBR Director of Livestock Cody Lambert said Leme’s ride on Frequent Flyer could have been scored even higher. The No. 3 rider in the world standings went only 2-for-4 in Arlington, but Leme’s two rides, especially his final one, came with some of the biggest stakes of the weekend. Davis tipped his hat to Leme following the event. The captain of the Eagles has come to expect those kind of rides from Leme in his brief three-year career. Nunes said he did even bother talking with Leme before his Biker Bob ride attempt. He knew worst case scenario that he would be rolling Leme right back out there in the Bonus Round with an opportunity for Leme to redeem himself if necessary. Leme was bucked off by Rodeo Houston in 1.78 seconds, which gave the Americans and Davis one last opportunity at the victory. However, Davis was bucked off by Bad Beagle in 4.63 seconds. Leme has been a part of every Global Cup team, and he is honored to do his part to help Brazil go back-to-back. “Every time you win back-to-back in anything, that means you did a great job and you didn’t get lazy,” Leme said. “You kept hustling and did good. Just being the consecutive two-time Global Cup champion, that’s just great.